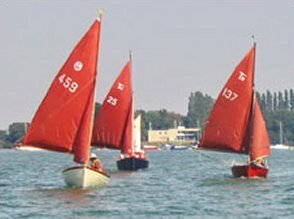 Sailed and raced at a number of locations in the UK. Early boats from the orginal builder were available in a number of lengths from 8' to 14' and with many variations in fixtures, fittings, sails, rig and hulls. This 12' foot version, known as the TIDEWAY, built in mahogany on oak, has been the most popular. New boats are still available. See class website for more details.